2 Days in New York is Julie Delpy’s sort of sequel to 2 Days in Paris. 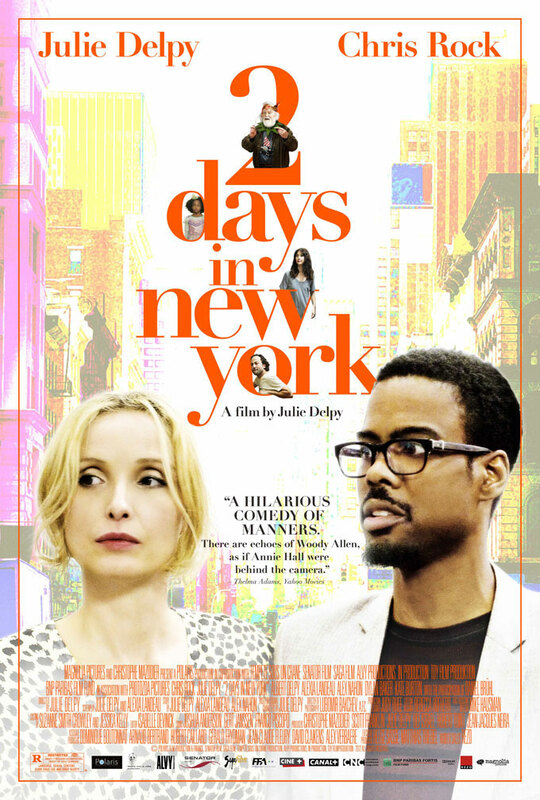 This time we find Marion (Julie Delpy) living in New York with her new boyfriend Mingus (Chris Rock). The young couple appears to be doing well together, until Marion’s family from Paris decides to visit her in New York city on the eve of her new art-show. If you’re a fan of Julie Delpy then you’ll know exactly what to expect from this movie. There are no explosions, no car chases, and pretty much no action of any kind. The film instead relies on a script (written by stars Delpy, Alexia Landeau, and Alexandre Nahon) featuring witty, funny dialogue more exciting than any action scene directed by Peter Berg. While Delpy is charming, as always, it’s the film’s co-stars (Chris Rock, Alexia Landeau, and Alexandre Nahon) who elevate the film from a typical french rom-com to something a bit more fulfilling. As strange as it is to see Chris Rock talking about Jean-Luc Godard and Fellini, he does a pretty good job of playing a New York hipster. Alexia Landeau plays the part of the nagging jealous sister perfectly as she continues to compete with Marion about everything, no matter how minute. Alexandre Nahon plays the embarrassing ex-boyfriend from hell hilariously as his character manages to wedge himself into Marion and Mingus’ lives by dating Marion’s sister and making things as awkward as possible for everyone. Even Marion’s father, played by Delpy’s actual father, is a big embarrassment. Being a fan of Julie Delpy ever since watching Richard Linklater’s Before and After Sunrise films I will happily watch anything she stars in. This movie is no exception. If you’re new to Delpy or have never even heard of her I would recommend watching Before Sunrise to get a taste of her style. Otherwise, any fans of Delpy will have a good time watching this film and will be delighted by a very funny cameo near the films end. 2 Days in New York is currently playing in Philly area theaters.